I discovered an interesting point (pun intended) while figuring out the best way to redeem my wife’s 51k ThankYou points from her Citigold account as I’m looking to close the account soon. As you may remember, it was a huge mess earlier this year fighting for my wife’s 50k ThankYou points for opening a Citibank Citigold Account that involved several rounds of messages, phone calls and finally a CFPB complaint. While I succeeded in having the points awarded to my wife’s account, I haven’t had a chance to use them for anything yet until I began looking to redeem them for a flight to St. Lucia next year for a wedding. Historically, only Citi ThankYou points linked to a Citi Premier or Prestige could be transferred to airlines or hotels. However, with the news that JetBlue is now a transfer partner and no annual fee cards like the Preferred could transfer ThankYou points to JetBlue, I wondered if Citigold ThankYou points could be transferred as well. Alas, the answer is no but I did determine that Citigold ThankYou points are transferable into Sears Shop Your Way points. I did a little digging into the terms & conditions and sure enough, only a ThankYou Rewards account is required to transfer points to Sears (the language is different for airline/hotel transfers). The transfer ratio is 1 ThankYou point to 12 Sears Shop Your Way (SYW) points but before you get all excited, that is a value of just 1.2 cents in value per ThankYou point and you are stuck shopping for all the “fine” merchandise at Sears. Unless you an extreme Sears shopper, a reseller who understands the SYW program or looking to top off your SYW account if you are close to some free merchandise, I can’t recommend this transfer option. That said, I still think it’s a positive sign Citibank is adding new partners and hopefully they continue to improve the ThankYou points program. Update: Looks the bonus will remain at 50k but spending will be increased to $5,000 in 3 months, no more 2x for dining and no more AA lounge access after 6/20/17. Still worth applying for today if you were interested to begin with in my opinion. Unless you’ve been without internet access for the past week, there have been a slew of posts about how the signup bonus is changing tomorrow on the Citi Prestige card (if you did miss those posts, I’m sure there will be about 80 more today with titles like “LAST CHANCE” or “HOURS LEFT”). Anyway the signup bonus is currently 50,000 ThankYou Points for spending $3,000 in 3 months and I decided it was time for wife to get the card before the signup bonus changed. Officially we do not know what the new signup bonus will be but per the comments on this Doctor of Credit post, the signup bonus will be lower, if there is one at all. 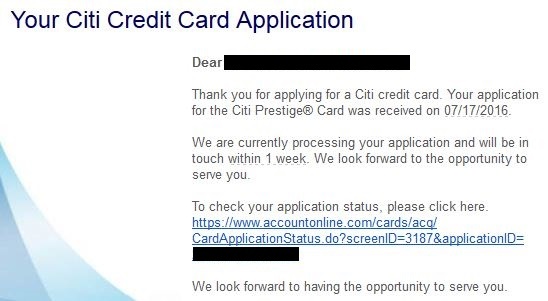 I personally believe Citibank will drop the signup bonus to zero, just like they did on the ThankYou Premier card, so I wanted my wife to get the card and an easy 50,000 points before the opportunity was possibly lost for good. She applied last night and got a pending approval message that Citibank could not give her a decision right now but she was welcome to call in about the application. She was hesitant to call but I pushed her to call in ASAP because I wanted the approval to happen before the signup bonus officially changed. By the way, if you are not a Citigold account holder remember to signup in branch to get the reduced annual fee of $350 vs the standard $450. Zombie Citigold accounts (accounts that were Citigold but now Basic for example) should still work for the reduced annual fee of $350. I’ve had the card for over a year now and I’ve argued it is a stronger premium card than the American Express Platinum card. The plan is to keep my wife’s card for just one year since we don’t need two Prestige cards in the household with the duplicative benefits such as the 4th night free, lounge access etc. In one year, I’ll probably downgrade her account to the no annual fee Thank You Preferred to preserve any unused ThankYou points. When I need to actually use them after downgrading her card, I’ll simply transfer them to my Citi Prestige card to get the maximum value of them by transferring to airline partners or redeeming them for paid AA flights at 1.6 cents/point. Here is a direct, non-affiliate link in case you decide to apply. This should be the last post in what has turned out be a three part saga but I have good news for those who are still fighting with Citibank on getting the bonus from the Citigold offers earlier this year. As a recap, here is Part 1, in which Citibank refused to payout the 50k signup bonus and here is Part 2, in which Citibank agrees to award the points but hadn’t posted them. In my last update, Citi posted the results of their “investigation” that finally determined my wife was now suddenly eligible for the bonus (after the first “investigation” stated she wasn’t) but I wasn’t sure if it was because of the CFPB complaint or just overall persistence. 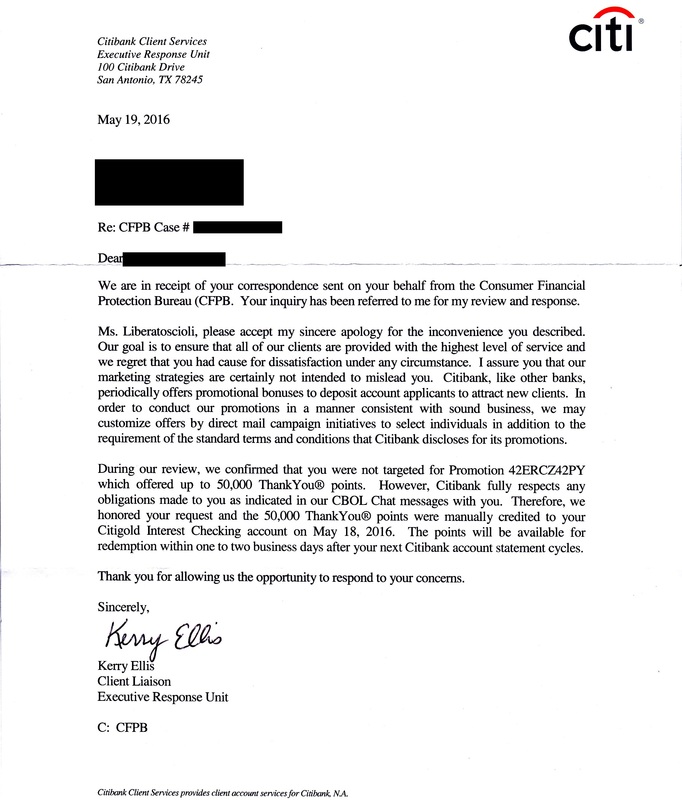 Well this week, my wife got a letter in the mail that was an official response to the CFPB complaint. I’ve scanned a copy of it below. One interesting point I took away from that response was Citi once again stating how my wife was not truly eligible for the bonus but because Citibank representatives had confirmed the bonus to her in writing via their secure message system, they would honor it. I’m fairly confident that if my wife never followed up with Citibank to confirm her eligibility for the bonus after the requirements of the offer were met, they would have denied her the bonus. My advice for those that are still fighting for the points, if at any point Citibank confirmed the bonus in writing to you and they are refusing to payout, submit a CFPB complaint. Since several of you asked in the last post, the points have now finally posted to the account. The timing of all this seems a little strange – this response letter was dated 5/19 (but I didn’t receive it until 5/27) while the “investigation” letter was from 5/20 and said the points would post in 30 days…except this letter above said they were already credited on 5/18 and I would see them after my statement cycle closed. I also downgraded her account to a Basic Checking account last week before the points posted so that doesn’t seem to have any bearing. Either way, I’m just happy the points posted. In this last update, Citibank issued a formal response to my wife’s CFPB complaint and actually posted the points to her account. This is the first time in almost 5+ years of “travel hacking” that I’ve had to fight so vigorously for a signup bonus on a bank account or credit card. Am I happy with how much effort and time this took? Not really but I will easily reap anywhere from $470 (50,000 points at 1 cent/point – $30 fee charged in April) to $770 (if I transfer all these points to a Prestige card & book paid AA flights at a value of 1.6 cents/point – $30 fee charged in April) so in the end I still consider this deal a success. I think the biggest takeaway from this whole experience is to always confirm the signup bonus on any offer, especially those offers that are targeted or not available to the general public. That was difference in this case from being in a net loss of $30 (plus a ton of time) to a net gain of $470 to $770.